Flint water linked to Legionnaires' outbreak, CDC findings may suggest. The Flint Water Treatment Plant on Sept. 14. 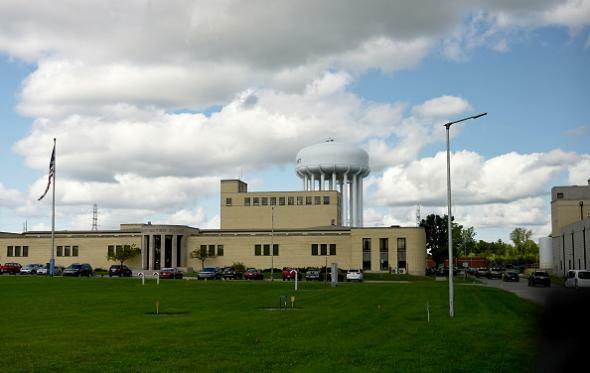 Centers for Disease Control and Prevention genetic testing may help prove that untreated Flint River water contributed to an outbreak of Legionnaires’ disease in and around the city, the MLive site reports. More than 100 individuals, of whom 12 have died, have contracted the bacterial disease in the Flint area since the outbreak began in 2014. Michigan state officials suspected in early 2015 that Legionnaires’ cases may have been linked to Flint’s 2014 decision to begin using the Flint River as a source of tap water but didn’t make that suspicion public until nine months later. City, state, and federal officials’ failures to properly treat and monitor Flint’s tap water after the Flint River switch are also believed to have caused an epidemic of lead contamination. The relevant CDC test found that a sample of water taken from the McLaren Flint hospital matched a sample taken from a Legionnaires’ patient who is not known to have received services at the hospital. The reason that’s important is because the state of Michigan is attempting to make the argument, disputed by McLaren officials, that the high number of Legionnaires’ cases during the outbreak that involved the hospital were attributable to the failures of its own internal water system. If bacteria found at McLaren match a patient who never spent time there, however, one logical possibility is that both the McLaren sample and the patient sample derive from a third, original source—like untreated Flint River water. An independent study published in July found elevated levels of Legionella (the bacteria that causes Legionnaires’ disease) in Flint tap water, though that study did not attempt to link specific patients’ cases to specific water samples.